Analysis: He spoke to something no other witness so far has been able to: his assessment of Manafort's motives. In a word, greed. WASHINGTON — Special counsel Robert Mueller may not need Rick Gates to prove crimes against Paul Manafort. But the appearance of Manafort’s longtime protégé in an Alexandria federal courtroom this week has made for riveting courtroom drama — turning what had been a dry case about tax and bank records into a political soap opera. Even U.S. District Judge T.S. Ellis said last week outside of the jury's earshot that prosecutors had proven that Manafort controlled foreign bank accounts and that he had personally denied having those accounts. The documents are clear on this point. Unless Manafort can convince the jury that was all an unhappy accident, he may be found guilty of felonies. But if the parade of contractors, bookkeepers and accountants who have testified so far gave the jury glimpses into the dark cave of criminality prosecutors say Manafort dug over the years, Gates is taking those six men and six women all the way down into the abyss — and showing them some of the hidden corners. Gates spoke Monday in soft tones, appearing slightly nervous but nonetheless projecting an understated manner, even as he admitted to a virtual crime spree. He spoke to something no other witness so far has been able to: his assessment of Manafort's motives. In a word, greed. Manafort stashed money in foreign bank accounts to avoid taxes and pad his income, Gates said. Gates helped with that, "at Mr. Manafort’s direction." “I was the one who organized the paperwork,” he added. Gates, 46, a father of four, lived a reportedly modest family life in Richmond, Virginia, while Manafort spent small fortunes on custom suits and landscaping in the Hamptons. He carefully avoided the flinty stares his former mentor shot his way from the nearby defense table. Manafort’s lawyers seemed eager to get to cross examination, where they will make every effort to paint Gates as a cowardly schemer who is lying to save his own skin. To counter that, prosecutors took Gates through a parade of bad acts, including crimes he committed that Gates said they didn't know about until he told them. That included a habit by Gates of padding his expense accounts — stealing, he admitted, hundreds of thousands from Manafort over the years even as Manafort and Gates, by Gates' reckoning, were defrauding the U.S. government. But Gates didn’t stop there. He admitted to lying on a deposition, falsely characterizing an investment, lying to the FBI, and even violating bail conditions by coming home 15 minutes late one night. Prosecutors want there to be no surprises, nothing derogatory in Gates’ background the defense can point to that they haven't already covered. 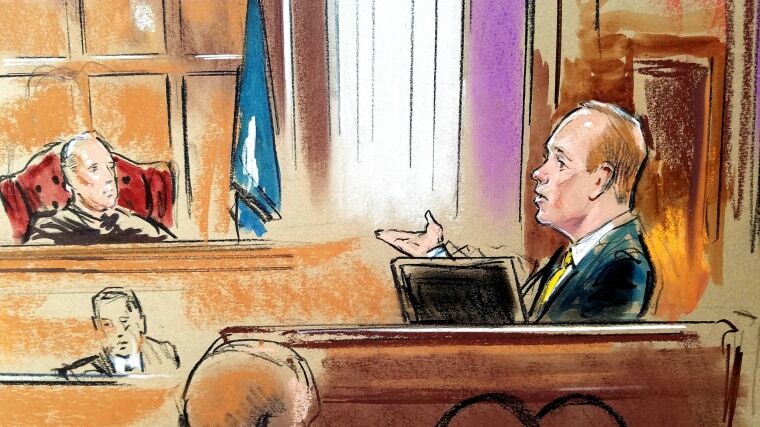 Under questioning, Gates told the jury that he was guilty of all the bank, tax and lobbying crimes alleged in an indictment filed against him and Manafort in Washington. But he cut a deal, he explained, and pleaded guilty to charges that would net him a reduced prison term of around five years, and possible probation, if his cooperation is helpful enough. He explained that he understands that if he lies on the stand, that deal is void, but his guilty plea still stands. The idea is that while the jury may not like him, they may well believe him. Prosecutor Greg Andres took Gates through his background — college at William and Mary, and an internship at Manafort’s old consulting firm in the 1990s. He served honorably in the Virginia National Guard, and spent his professional career in the influence-peddling business, including stints with lottery companies. Gates first met Manafort at a Christmas party at one of Manafort’s homes, he said. He worked for Manafort from 2006 to 2016, when it all came crashing down. By then Gates was deputy chairman of the Trump campaign, and the business he and Manafort built together had collapsed. Even after Manafort was fired in the summer of 2016 over his unsavory Ukrainian lobbying ties, Gates stayed in the Trump orbit, taking a position on the inaugural committee. Gates’ testimony continues Tuesday. He said he met with prosecutors 20 times while preparing. Donald Trump’s name is not expected to come up in the trial, nor is the issue of possible Trump campaign collusion with Russia. What, if anything, Gates told Mueller’s team about that subject will remain, for now, one of the mysteries of this unfolding saga.